All American Fence Erectors is a family owned and operated business. We started our business in Hesperia, California in 1985. Since then, we moved in 1990 to our 5000 sq ft building where we manufacture, sell, and install all types of fencing materials. We have a HUGE inventory on site for all your fencing needs. We are licensed, bonded, and fully insured. We run our business by the books and don't take any shortcuts to help protect you the customer. While many can say they have multiple years of 'experience' in this line of work, we on the other hand have proven ourselves to the entire Hi Desert for the past 32 YEARS with our commitment to serve you! 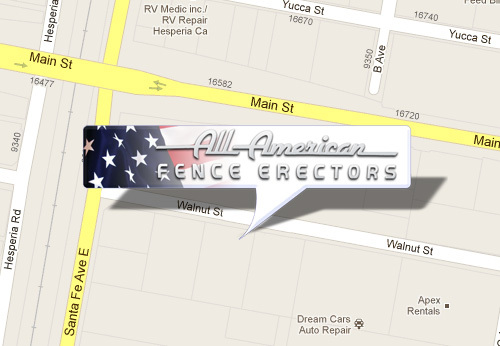 All American Fence Erectors is dedicated to providing all of its customers with quality work and outstanding service. We understand the needs of our customers and are willing to take the extra steps to meet those standards. We can provide your home or business with the fence you want that meets your needs. Our team of professional installers and sales personnel will assist you in developing the fence you need. We pride ourselves on our professionalism, our integrity, our knowledge, and our organizational skills. “ Extremely pleased with the Privacy Chain Link fence installed around my back yard. I've had work done before by All American Fence Erectors and would recommend this company. “ I found this company in the phone book and everyone was great. Their prices are very resonable, they worked quickly and did exactly what we agreed on. I would totally recommend this company! “ These guys installed my fence and graded my fence line. They are very knowledgable & friendly. Justin was able to locate my burried property pins to ensure proper location. Thank you for the great job! “ I had All American Fence Erectors install a 4' tall front yard fence with a rolling gate and it came out great. I was told that it would be done at a certain time and it was! Thanks guys! “ This company installed a fence for me and they were quick, neat, and did a very complete job. My granddaughter is going to get her fence done by this company also because she was pleased with the price and service provided!